This is David Archuleta’s fourth visit to the country. "I could safely say that I always have a blast when I come [here], so [for me], it’s always fun when I come to Philippines," he said. American Idol alumnus David Archuleta looked very happy when he faced local media yesterday, January 13, at the Garden Ballroom of Shangri-La Plaza Hotel in Mandaluyong City. David, 21, barely had any sleep since he left the United States and arrived in the Philippines early that morning, sleepy but alert. He answered questions from the press with humor and laughter. This is his fourth visit to the Philippines. After he placed second in the seventh season of American Idol in 2007, David visited the country three times for concerts and to promote his albums. His frequent visits has led David to believe that the country’s current slogan, "It’s More Fun in the Philippines," is true. "I could safely say that I always have a blast when I come [here], so [for me], it’s always fun when I come to the Philippines,"
he told the entertainment press including PEP.ph (Philippine Entertainment Portal). David added that he always looks forward to meeting Filipinos who are very warm. "For me, the number one thing about any place is the people. That’s what interests me, and what I remember most anywhere I go. "Especially here, I feel comfortable here. The people are very friendly and they’re very supportive." TV5 MINI-SERIES. 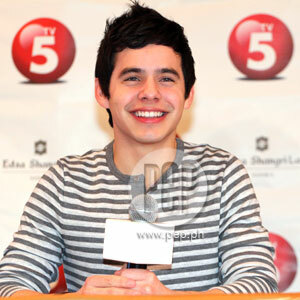 David’s primary purpose in visiting the Philippines this time around is to fulfill a new obligation with TV5. He has signed a contract to join the cast of an upcoming mini-series. Although he declined to say how much he was offered, he admitted that he agreed to do the project because he loves his Filipino fans. "Even though I may not be a [professional] actor, I thought this would be a really great new experience to try. "Especially in the Philippines because I feel very comfortable with the people and I feel the fans here are very warm," he explained. David’s mini-series is titled Nandito Ako. He will play an international singer born in the Philippines. According to the plot, his character was five years old when a fire ravaged his home, separating him from his mother. He grew up in the United States. Years later, he will come back to the Philippines to look for his family, and a girl he befriended during the fire. David believes his character will not be hard to play, because it is "just like him." He also does not have to learn to speak Tagalog for the role. "Most of the script will be in English. There will be a few words in Tagalog, but it should be easy," he said. David will be paired with TV5’s two homegrown actresses: Eula Caballero and Jasmine Curtis. The young singer said he is excited to work with the two ladies, whom he already met earlier that day. "I look forward to working with them. It’s [going] to be a different experience. It will be fun working with people my age," he said. Could he fall in love with any of his two leading ladies? "I guess you can never say whom you’ll fall in love with. I never say never. "But time will tell, you know? I don’t know who I will fall in love with," he said. CHURCH MISSION. The press also wanted to ask David about his recent announcement that he will take a break from his singing career to embark on a religious mission. He is a member of the Church of Jesus Christ of Latter-day Saints which expects its male members to serve a two-year mission. Members of the press were curious as his announcement was followed by news that he had signed a contract with TV5. According to David, he is very serious about serving his two-year mission, and the TV5 project does not clash with this decision. He explained that before he announced his decision, he already mapped out his schedule for 2012. He could still do showbiz projects as long as it would fit this schedule. "Coming to the Philippines... [it] fit my schedule before my departure. I will be leaving in a couple of months, but this is something I want to do before I go," he said. He will spend three weeks in the Philippines to film the mini-series. After that, he has to go back to the United States to prepare for his mission. He promised his fans that he won’t be away from public eye that long. "Two years will go really fast, man, it’s been four years since American Idol. "So, two years, it is part of my life, and it’s an important decision that I want to do in my life," he said. "Once I get back to the States, I’m gonna spend as much time as I can to record. "So even though I won’t be here, hopefully, I will still be here, you know, releasing new songs. "I want to make sure I have something for my fans," David promised.